The world’s first grid-scale liquid-air energy storage (LAES) plant, Highview Power’s 5MW/15MWh Pilsworth facility, is finally in operation, with a switch-on ceremony held on 5 June (about three years later than originally planned). 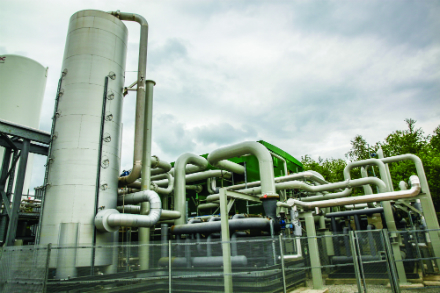 The plant, a pre-commercial demonstrator, has been constructed alongside Viridor’s Pilsworth landfill gas generation plant at Bury in Greater Manchester, UK, and has been developed in partnership with Viridor, with financial support from the UK government. The company estimates that 60% of the global energy storage market comprises long-duration, grid connected storage and thinks that its LAES technology is ready to meet almost half of this (45%). For the Pilsworth demonstrator, turbine and generator were supplied by GE, heat exchangers by Heatric, thermal storage tanks by Metalcraft and cryogenic storage tanks by BOC. Highview’s LAES system consists essentially of three basic processes: 1 - charging; 2 - energy storage; 3 - power recovery. The charging system comprises an electrically driven air liquefier. The air is cleaned and cooled to subzero temperatures. 700 l of ambient air become 1 l of liquid air. In the case of the Pilsworth demonstrator, liquid air/nitrogen is being delivered to the plant rather than being liquefied on site. The liquid air is stored in an insulated tank at low pressure, which functions as the energy store. When power is required, liquid air is drawn from the tank. Stored heat from the air liquefier is applied to the liquid air via heat exchangers and an intermediate heat transfer fluid. This produces a high-pressure gas, which is used to drive a turbine. The low boiling point of liquefied air means the round trip efficiency of the system can be improved with the introduction of any low grade waste heat that is available. Highview’s standard LAES system captures and stores heat produced during the liquefaction process and integrates this heat into the power recovery process. For the Pilsworth demonstrator, Highview is employing waste heat from GE Jenbacher gas engines at the Viridor landfill power generation facility. Although the Pilsworth demonstrator does not have the liquefaction stage, the full process was tested in a 350 kW/2.5 MWh pilot plant from June 2011 to the end of 2014 at SSE’s Slough CHP facility.